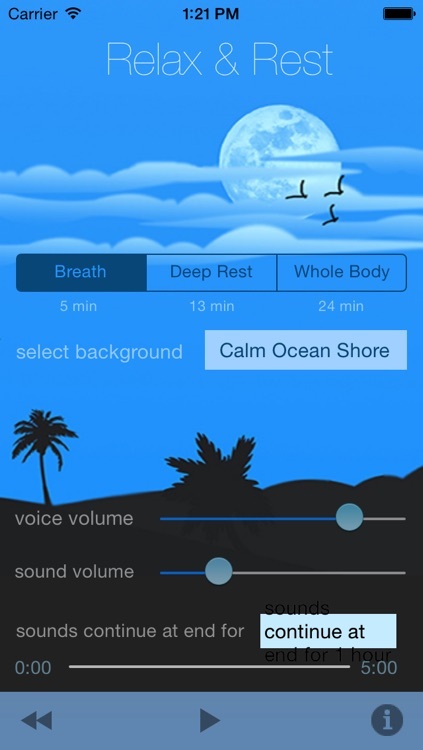 Relax and Rest is an app that will run on both your iPad and iPhone. The app allows you to customize your meditation experience. The app lets you choose music, nature sounds, or simply the gentle voice guiding you through your meditaion. 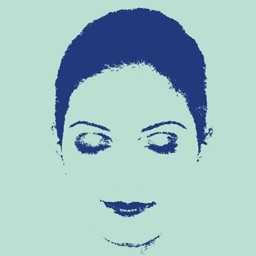 The app has three different length meditations: 5 minutes, 13 minutes, or 24 minutes. The app also lets you customize the volume of the voice or music/nature. The meditations given are very relaxing and quite helpful in clearing your mind. The other benefit is price: the app is only $0.99 making it a no-brainer. If you are looking for a great low cost universal meditation app, this is it. 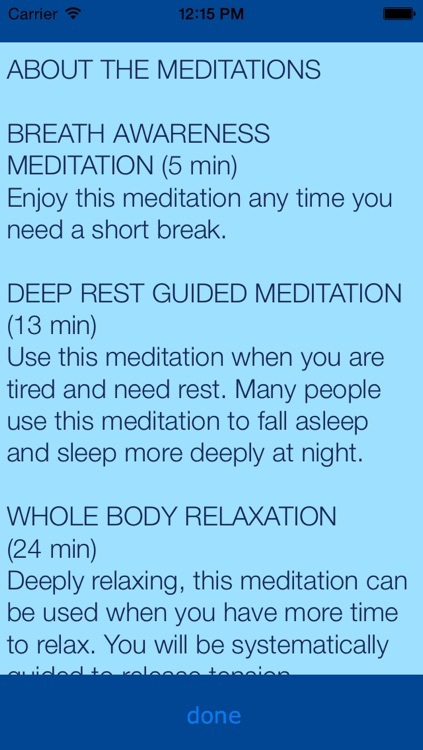 Enjoy the deep relaxation, stress relief and benefits of meditation with the Meditation Oasis® Relax & Rest app. 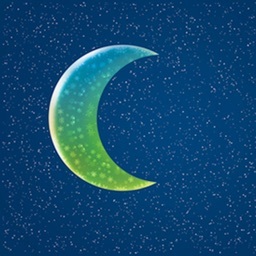 Chosen for "Best Sleep Apps of 2014" and "Best Anxiety Apps of 2014" by healthline.com. Three meditations of varying lengths allow you to relax deeply regardless of how much time you have available. Written Meditation Tips help support your experience with the guided meditations. No previous meditation experience is required. -- Breath Awareness Guided Meditation (5 min) - to get centered and relaxed when you only have time for a short break. -- Deep Rest Guided Meditation (13 min) - allows you to sink into a deeply restful state. 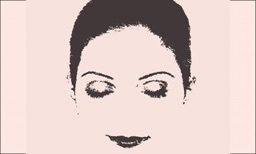 Many people use this meditation for falling asleep. -- Whole Body Guided Relaxation (24 min) - Relax totally and completely with this meditation which helps you locate tension in every part of the body, and let it go. Each meditation can be listened to with or without music or nature sounds, and you can choose how long to listen to the music or nature sounds after the guided meditation finishes. Separate volume controls not only allow you to adjust the mix of voice and sounds to suit your preference, but give you the added option of listening to the music or nature sounds alone. 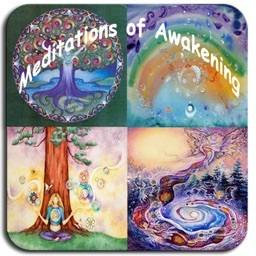 - Listen to the meditations with or without music/nature sounds. - Separate volume controls to customize your voice/background mix. 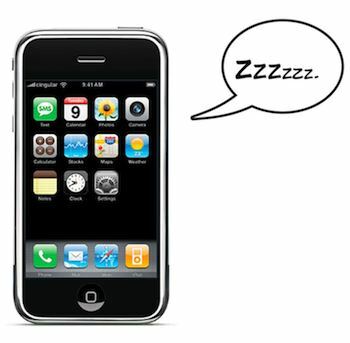 If you have trouble falling asleep at night, check out this concise list of iPhone sleep aid applications. If one of them doesn't help you, nothing will!